(Nanowerk News) Our Earth consists of silicate rocks and an iron core with a thin veneer of water and life. 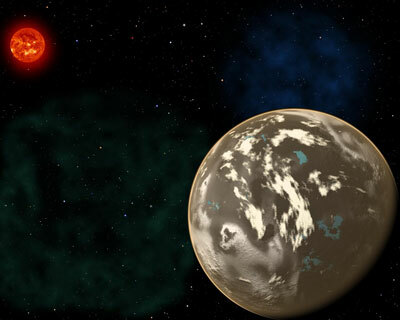 But the first potentially habitable worlds to form might have been very different. New research suggests that planet formation in the early universe might have created carbon planets consisting of graphite, carbides, and diamond. Astronomers might find these diamond worlds by searching a rare class of stars. "This work shows that even stars with a tiny fraction of the carbon in our solar system can host planets," says lead author and Harvard University graduate student Natalie Mashian. "We have good reason to believe that alien life will be carbon-based, like life on Earth, so this also bodes well for the possibility of life in the early universe," she adds. Mashian and her PhD thesis advisor Avi Loeb (Harvard-Smithsonian Center for Astrophysics) examined a particular class of old stars known as carbon-enhanced metal-poor stars, or CEMP stars. These anemic stars contain only one hundred-thousandth as much iron as our Sun, meaning they formed before interstellar space had been widely seeded with heavy elements. "These stars are fossils from the young universe," explains Loeb. "By studying them, we can look at how planets, and possibly life in the universe, got started." Although lacking in iron and other heavy elements compared to our Sun, CEMP stars have more carbon than would be expected given their age. This relative abundance would influence planet formation as fluffy carbon dust grains clump together to form tar-black worlds. Mashian and Loeb argue that a dedicated search for planets around CEMP stars can be done using the transit technique. "This is a practical method for finding out how early planets may have formed in the infant universe," says Loeb. "We'll never know if they exist unless we look," adds Mashian. This research has been accepted for publication in the Monthly Notices of the Royal Astronomical Society and is available online ("CEMP stars: possible hosts to carbon planets in the early universe").